Bennett Miller was down in the dirt on the wrong side of an iron fence, looking through without being quite sure what he was hoping to find. It was 2007, and he, his producer, and his screenwriter had traveled on a research trip to Foxcatcher Farm, a 416-acre compound outside of Philadelphia, in search of the kind of insight that only proximity can provide. Until a few years earlier, Foxcatcher had been home to the du Pont family, multi­millionaire corporate titans who started building their fortune as gunpowder manufacturers in 1802, and who had seen their name disgraced in 1996 when John ­Eleuthère du Pont, a damaged and ­delusional heir to the family dynasty, had shot a man to death in the driveway of one of his guesthouses. Nearly a decade later, Miller has wrenched an austere and challenging movie out of that bizarre tragedy. Foxcatcher is an exploration of two worlds—extreme wealth and Olympic-level wrestling—and of the dissociation that total immersion in either can bring about. 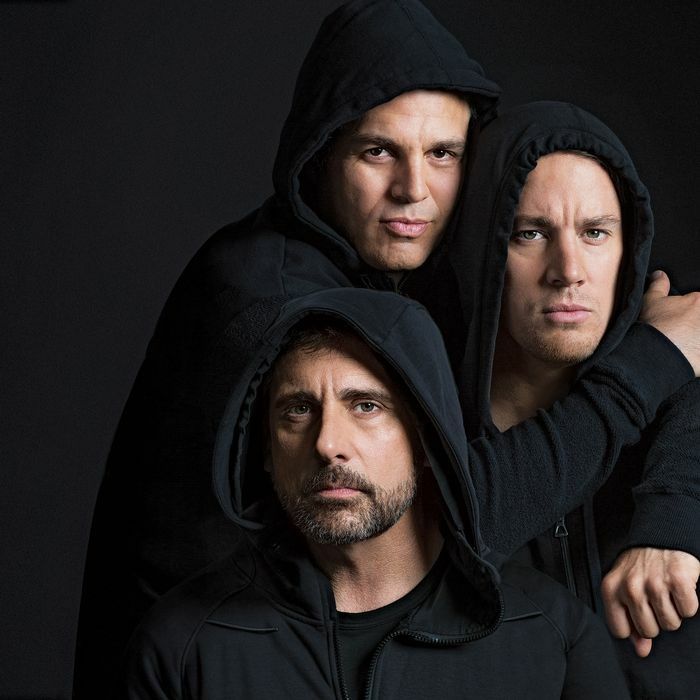 The movie—which stars Steve Carell as the stiff, disconnected, vain du Pont, and Channing Tatum and Mark Ruffalo as brothers Mark and Dave Schultz, the wrestlers with whom he became obsessed—entered the Cannes Film Festival in May unseen. Ten days later, it emerged as what Variety’s film critic Justin Chang called “perhaps the [festival’s] sole credible awards season heavyweight,” winning acclaim on the order of Miller’s other two features, Capote and Moneyball, and a six-minute ovation. The spotlight is an unusual place for Miller, a deliberative and beyond-low-key 47-year-old who shuns attention and says he is both physically and constitutionally incapable of raising his voice. Until now, he has offered film buffs almost no public persona—he has been, in chronological order, the guy who came out of nowhere to make The Cruise, the guy who came back out of nowhere to make Capote, and the guy who replaced Steven Soderbergh on Moneyball without dumbing down the movie or making everyone hate him. But Foxcatcher makes apparent a throughline—rigor, lack of sentiment, and emotional precision applied to a series of coolheaded portraits of fragilely self-invented men—and nails down his status as a major American director. Miller grew up in Westchester, went to public school in Mamaroneck, and had his first that’s-what-I-want-to-do moment not at the movies but at a community-theater production of The Miracle Worker that “left a huge, huge impression. The mother screaming into the crib realizing that her child was blind and deaf. I remember walking onto the stage afterwards through the fake door of the house and it completely captivated me.” Another seminal moment: a grade-school classroom screening of Nicolas Roeg’s hushed 1971 film Walkabout. “The language of the film, its silences and the undercurrents of those silences, really struck me,” he says. After studying theater and film at NYU, he left a few credits shy of a degree. (“I wasn’t precocious enough to drop out more quickly,” he jokes.) He broke through in 1998 with The Cruise, a portrait in near-monologue form of Timothy “Speed” Levitch, a loud, polymathic, and drolly self-dramatizing double-decker-bus tour guide. The film seemed to anticipate an era in which seemingly everyone would imagine themselves as the stars of their own reality shows. In retrospect, though, it’s notable not just for Levitch’s motormouth but for Miller’s complete command of silences—the way he trains a steady gaze on his subject at the moment when his words run dry—and for his revelation of character not just through what is said but through the cadence of the voice that’s saying it. Levitch’s honking slam-poetry rhythms; the flamboyant, drawling whinny that Philip Seymour Hoffman found for Capote; and the halting, spookily hollow delivery Carell deploys in Foxcatcher collectively constitute a Miller signature. “I’m fascinated by people who have real voices,” he says. Then came Capote. Screenwriter Dan Futterman brought him the idea, and Miller took it to his NYU classmate Hoffman, whom he’d known since they were both 16 and attended theater camp together. Miller, who had been struggling to pull together a second documentary, was cautious about jumping into feature directing, and Hoffman, he recalls, “had doubts about himself. Hoffman weighed 240 pounds at the time and had that deep, booming voice. It’s hard to appreciate what an extraordinary decision it was for him to put that much faith in me.” On the Capote set, Miller says, “the two of us were sort of a perfect storm of self-brutalizing, impossible standards—unforgiving, with the ability to suspend all other concerns and to assign huge stakes to what we were doing. It was miserable and ecstatic at the same time”—a combination that, a decade later, looks as emblematic of Miller’s M.O. as of the actor’s. The result won Hoffman the Academy Award, and Miller a nomination for Best Director. He first heard about the Foxcatcher story soon after the 2006 Oscars when an attendee at a Cruise DVD signing handed him an envelope full of clippings. The figures fascinated him—du Pont, an eccentric 57-year-old dilettante who lived on his mother’s vast estate on Philadelphia’s Main Line; Mark Schultz, a competitive wrestler who had won Olympic gold in Los Angeles 12 years earlier and was struggling to come back; and his older brother Dave, also a 1984 gold medalist wrestler turned coach. The accounts were intriguing both for what they revealed—with no expertise in wrestling, du Pont had decided to become patron to a squad of Olympic hopefuls, luring them by building a state-of-the-art training facility for what he preeningly called “Team Foxcatcher”—and for what they omitted: What, exactly, was the tangle of money, pride, rage, and madness among the three men that left one dead and one in prison? By 2009, Miller felt the script was ready to take to MRC, the financing company (Babel, Ted, Netflix’s House of Cards) that had agreed to back the writing and research of the movie. Independent film capital had all but dried up after the 2008 crash, and the cast Miller proposed—including Tatum—didn’t, at the time, offer much star power. What followed was a somewhat ugly wrangle—“difficult and disillusioning,” Miller says—that eventually ended with his switching ­lawyers and agents, repaying MRC the development costs of the film, and ­realizing he might not be able to get his passion project made. By 2011, the jigsaw pieces had all begun to line up. Tatum was now a movie star. Miller had just directed what would turn out to be his second straight Best Picture nominee. And Megan Ellison, the director-friendly producer-financer who has, in the past four years, backed offbeat projects by Paul Thomas Anderson, David O. Russell, Kathryn Bigelow, and Spike Jonze that would otherwise have struggled to find studio support, was ready to add Miller to her list; after meeting him, she agreed to back the film without reading a script. Tatum and Ruffalo followed their 12-hour shooting days with wrestling practice. It takes a long time to gestate something like this, but that’s its nature,” Miller says back in New York. “I imagine that maybe I’m doomed”—he cracks a smile—“to this kind of laborious thing where there’s a lot of exploration and trial until you get there. You can write ten versions of a scene and then, on the day, discover that something in the original scene worked. It’s hard on writers. Hard on actors, hard on editors, hard on me, hard on the producers, who require patience and confidence. But I can’t get to the end without going through this process.” Foxcatcher will screen at this year’s New York Film Festival before opening on November 14. Miller doesn’t know what, or when, his next movie will be. *This article appeared in the August 25, 2014 issue of New York Magazine.